I’ve been missing! My guilt at not posting on my blog is growing HUGE! Then I tell myself that everyone has times when everything seems a little overwhelming. Step-Dad got through his cancer operation okay. My mother has found it hard, especially as she likes her space and my step-brother and step-sister have been staying with her. Why are the hospitals always so far away? No joke to be driving so far at nearly 80. Cue another guilt attack. Hubbie is only having one evening meal a week at home at the moment with his punishing work schedule – which I suppose increases my work schedule too. Add in a few other family issues and my blog has not got written. On the positive side, in a bid to avoid a couple of return journeys from school, last week I tried driving to the Park and Ride close to school and spent the day in The Hive at Worcester. 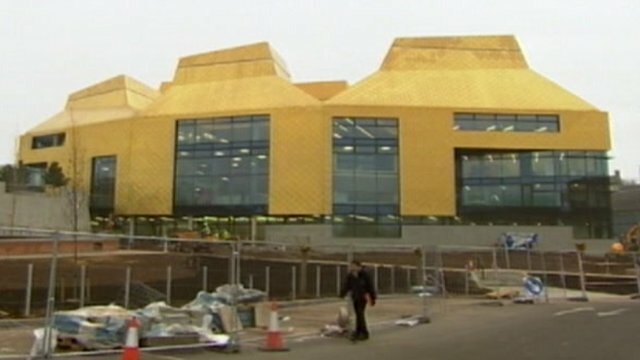 This is the new library, archives and hub building in Worcester which has a strange gold roof. The Park and Ride was fantastic – I’d already written three character studies by the time they dropped me off. I found a table in The Hive with a view of the moon and the Malverns and edited non-stop for two hours. Lunch in one of my favourite cafés The Ginger Pig and then back for another two hours solid editing. A thoroughly successful day and one I hope to repeat often. I have come to the conclusion that I will edit more successfully away from home as there are less distractions. Does this work for you too? Sorry to hear you've been having a hard time. Life does have a habit of dumping things on you, doesn't it? But what a great day you had at The Hive – I'm jealous! Don't worry about being gone a bit, I've been absent far longer XD And while you've been busy, I'm glad you're finding time for yourself. And yeah, I always do better working away from home. It's a nice mental and physical break. And as I'm usually at a coffee shop, the caffeine is a nice boost. Good to hear from yhou again Morton! And that sounds a good place to work – good luck with it. Good to see you back again Morton and hope life calms down a bit for you soon!